Many of us have been fans of one amazingly talented girl since the very beginning of her career as she was one of the firsts to grasp our attention by playing the guitar and covering popular songs in her bedroom... But as she worked her way from performing in front of her webcam for YouTube, to performing at the Billboard Music Awards, and to now headlining her "Where I Belong" tour this summer, Tori Kelly has easily won over the hearts of music lovers and dream chasers all over. To many, it may seem as though Tori has entered the industry as an overnight success, but she has had years of experience under her guitar pick before the official release of her debut album, Unbreakable Smile, blew up the charts on June 23, 2015. The Darla Magazine team had a chance to attend two shows of the "Where I Belong" tour last week; at the TLA in Philadelphia and the Best Buy Theatre in NYC and both performances were beyond what we could have imagined. Tori lit up the venues with her vocals performing new songs, older songs and of course, covers that we loved every second of. With different guests in both cities, including Gavin James and LL Cool J, the surprises incorporated into the shows made each night unforgettable. 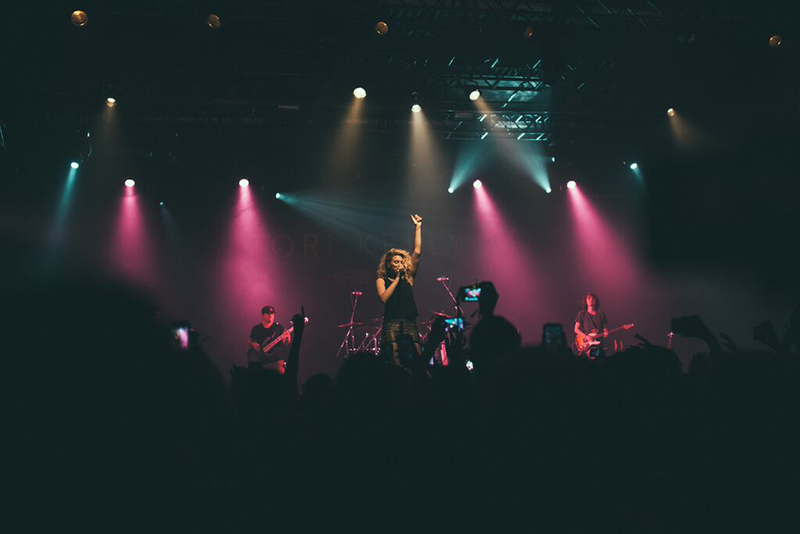 Tori Kelly brings a certain type of energy to the stage and she has proven herself to be capable of "selling out shows without taking off her clothes" and to establish an eclectic crowd of supporters. Right before the Good Morning America performance of her latest single, "Should've Been Us," Tori explained what her relationship has been like with her fans while establishing her career. It's exciting too, because of the type of fans that I have -- we feel like we're all on this journey together and it's not like an overnight thing. It's like we've evolved through it. I think that's what makes the album release really special. The Unbreakable Smile album is a reflection of Tori's unique background and taste in music. With musical influences such as Jill Scott and Justin Timberlake along with many others she has admired since she was a child, Tori managed to create an album with the perfect a combination of pop and soul. After covering Jill Scott's "It's Love" in Philadelphia, she explained how that song was one of the firsts she performed on stage when she was just 12 years old. Over the years, her original music has become what fans describe as, "the soundtrack to my life" with extremely relatable songs about love and heartbreak, good days and tough days, standing out and staying true, dreaming, chasing, and finally reaching the place right where you belong. Beyond her singing and songwriting talents, Tori Kelly's positive energy and kind heart is what has allowed her to grow to become a legend in the making. Her music is addictive, her smile is contagious, and her all-around spirit is what will keep everyone wanting more. She's changing the world with every lyric she writes and lighting up the eyes of anyone who wants to do the same. As a true fan, being able to watch Tori Kelly chase her dreams and achieve her goals is a big part of inspires me to do the same. I can't wait to see how it all comes together, but I'll be sure to always appreciate every moment of the journey along the way. Unbreakable Smile is now available for purchase in stores and on iTunes. Stay updated with Tori Kelly's journey by following her @ToriKelly on Instagram/Twitter and @KoriTelly on Snapchat. A very special thank you to our contributing photographer, Hidenori Dengah. Follow his amazing work @Hideryu and visit his site at http://hideryu.com.